Finding an abundance of joy in generously sharing my extreme poverty. The Atonement: Read this first! Discussing the Atonement – a lot! Philadelphia – the “city of brotherly love.” That is what the word philadephia means: love of brothers. It wasn’t named that because that was the city’s character or out of some sense of wanting a community that represented brotherly love – the name comes from 2 real brothers – Attalus and Eumenes in the 2nd century B.C. Eumenes was king over the ancient empire of Pergamum. In 172 B.C.E., Eumenes, sided with the Romans in a major battle, was attacked and reported dead. Attalus immediately replaced his brother as King and then married his brother’s widow in order to care for her. A short time later, Eumenes turned up alive. Upon returning home, Attalus divorced the widow he had married so she could return her to her husband, and then ceded the throne back to his brother. And for this display of love and loyalty to his brother, he earned the name Attalus philadephias. And thus this city is named after him. This city name will play an important role in understanding some of what Jesus has to say to His church in this city as we progress. And I will say up front that this particular letter is so packed with Old Testament references and allusions, that we’ll have to break it into 2 parts – this week and next. Which also tells us something about the Philadelphian Church. It tells us Jesus assumed they were so conversant with the Old Testament, that the connections He makes would be readily recognized and accessible to them in a practical way. It makes me wonder if Jesus wrote such a letter to us today – would we know our Bibles so well, the connections would be as obvious to us as they appear to have been to them? Historically, Philadelphia had been wracked with violent earthquakes throughout its history. In 17 C.E., it was the epicenter of such a devastating quake that the Emperor Caligula – as insane as he was, still gave them a 5 year break from paying their tax tribute while they rebuilt. Even to the time of the writing of this letter, they were continually plagued by aftershocks. In fact few people lived in the city proper because the buildings kept falling down. At the same time they were in the most productive grape growing region in the Roman empire due to its exceedingly rich volcanic soil. That is, until the Emperor Domitian (died 96 around the time this letter was written) decided the Empire needed more corn, and ordered ½ of all the vineyards there cut down in order to grow corn. It totally devastated the local economy. Tho the soil was exceptional for grapes, one can barely grow corn in it at all. They were wiped out by his unthinking plan. All of these things will factor into the balance of the letter as we progress through it. Without any divergence from the pattern Jesus has used so far in the previous 5 letters, He begins once again with an appeal to the vision in Ch. 1. You will recall how the vision there represents Jesus as both a High Priest, and a King, and in purity and power. These ideas are fleshed out even more here – tho not as directly as in some of the other letters. Jesus points to 4 things about Himself that are vital for this church who will receive no rebukes and only encouragement from Him. These speak directly to the Church which is living in a place of poverty, continual upheavals due to earthquake activity, victims of governmental flip-flops and mismanagement and additionally, persecution by the local Jewish community. Who has “the key of David”And who opens and no one will shut, and who shuts and no one will open. And who opens and no one will shut, and who shuts and no one will open. Lest we miss the point here – Jesus is reminding His people that because of Who He is, they stand in a much different place than their external circumstances might make it seem. As opposed to the debauched and insane Caligula – King Jesus is the Holy King. He CANNOT sin against them. He cannot do them wrong in any way. Contrary to the uninformed Domitian – Jesus not only knows all things truly, but is Truth Himself! He will neither deceive them, nor make decisions on their behalf that are miscalculations or harmful. Having the key of David – He is a present ruler over all as God’s appointed King – and they are under His authority, care and protection – especially in spiritual reality – no matter who sits in the seat of political power. And as The One who opens and no one shuts, and shuts so that no one can open – He alone determines who gets an audience with God and who does not. To unpack that last phrase about the open door that He opens and none can shut etc., we need to see where it comes from. 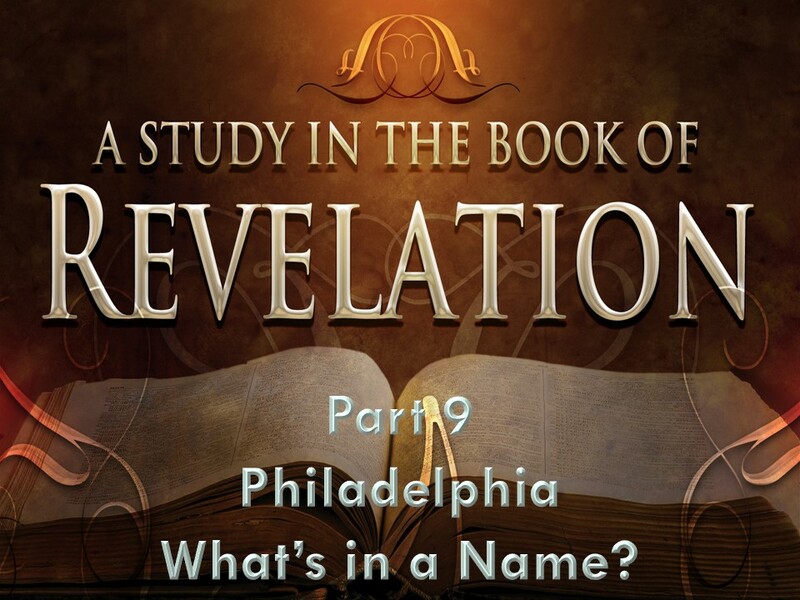 For it is a powerful reference to a scene unfolded in Isaiah 22 – that would have spoken volumes to the Philadelphian first readers. To spare you too much detail, Isa. 22 tells the account of Israel at a very sad point in its history. A point the Philadelphian church could identify with. Vss. 1-14 Paint the initial picture. The setting is the time of the reign of Hezekiah. Jerusalem had been threatened by Assyria, and Hezekiah thought he had bought the Assyrians off with a large sum of gold. That delayed a siege but didn’t prevent it. As Assyria pressed again, Jerusalem was delivered miraculously. An angel of the Lord killed 185,000 of the Assyrian troops in one night – and they withdrew. This was a result of humble prayer and seeking the face of God on the part of the King. But more was going on as well. That done, the leadership and the people began to put their trust in making preparations for future attacks by building new walls and fortifications, gathering weapons, diverting their water supply so it could not be cut off by foreign raiders and even tearing down houses to get material to fortify themselves. Upon completion of their preparations, they broke out into a massive party – thinking themselves now impervious to any further attacks. Isaiah sees this scene, but his interpretation of it is far different from theirs. There is nothing wrong in being rightly prepared, but their problem was a spiritual one, not just a military one. And this is key to the Philadelphians as well. For it is easy for us to have a merely earthly perspective on crucial things, putting our eggs into temporal baskets while forgetting the real need and the greater picture as seen from God’s perspective. While the inhabitants of Jerusalem are partying – reveling in their new found, self-made security – Isaiah thinks about the number of towns and villages that had been decimated in these previous attacks, and the 200,000 plus Jews taken captive. He is weeping and lamenting over them while those in Jerusalem are celebrating their ingenuity and preparedness. This is no time for revelry in Isaiah’s eyes. And on top of that, he looks ahead to the day when the Babylonians will eventually come and burn Jerusalem to the ground – despite the preparations they think have made them so safe. They were trusting in their own power and solutions – and not repenting and crying out to God for His continued intervention. These are two very different points of view. Vss. 15-26 Narrow the focus down to two men. Shebna and Eliakim. Shebna was the King’s steward, and the man most responsible for this great defensive campaign they had embarked upon. And once the revelry started, he actually went out to build for himself a monumental tomb – so that he would be remembered as a hero in posterity. So unfitting were his actions, both in putting his and the people’s trust in their armaments, and planning for his legacy, that God pronounces He will remove Shebna from office in disgrace, and put Eliakim in His place. Do you see the wording Jesus pulled directly from this passage? He will place on Eliakim’s shoulder the key of the house of David. He shall open, and none shall shut; and he shall shut, and none shall open. The 2-fold picture is this: One, who acts with the full authority of the King has the key of the house of David on his shoulder. In John’s vision of Jesus in ch.1 you will remember Jesus holds the keys of death and of Hell. Holding “keys” is always a symbol of authority in the Bible. That vision is now expanded further. The key speaks of His authority, and that it is on His shoulder depicts His bearing the full weight of it. But the imagery isn’t, over yet. He goes on to use the phrase regarding opening a door which none can shut, or shutting a door no one can open – as part and parcel of having the key of David or the authority of the King. It is common to take this image as indicating that the Philadelphian church had a door of opportunity for witness open to them, even in the midst of their difficult circumstances. And while that idea is certainly true, the question is whether or not that is what is being intended by Jesus appealing to the words of Isaiah 22. Based upon the Isaiah passage, we come away with a rather different focus. One which was aimed at bolstering the faith and confidence of this diminutive and suffering assembly. In the day of Isaiah, one who had the King’s key on his shoulder, to act as the King’s direct agent with all of The King’s authority – was also the one who alone granted or prohibited an entrance to gain an audience with the King. If this guy opens the way – you can get in. If He shuts the door, you have no chance. To a Church with no access to the throne of political power in Rome; who suffer constant uncertainty due to their location; and under whims of foolish and sinful leadership – their situation must be understood in far different terms than just these surface facts. They needed to be reminded that no matter what things might look like on the surface, the reality is far different once the place of Christ in the whole matter is considered. They must know that Jesus the Christ, their Lord and King – King over the Caesar; King over creation and earthquakes; sovereign over circumstances and certainly over His own people; – this Jesus has the full authority of Heaven. And above all – He opens for them a door of access to the very throne of the Living God that no one can shut or keep them from. They are to lift their eyes above the world around them, to see things as they REALLY are, through the eyes of God! And then to remember that they have been granted access to the true throne of power in the Universe – the throne of God Himself. And what a powerful word that is for us today as well isn’t it? I cannot help but think how many in this last Presidential election began to put their hope and trust in political swing rather than looking to the heavenly perspective? Looking to Supreme Court Justices and political parties and appointees. Looking to the advent of new policies and direction. But our great hope doesn’t rest in any of those – as good as they may be in and of themselves. The one who alone has the power to shut that door so that only those who are His may have this place and its benefits. Why does He care so much that His people in these straightened circumstances focus upon His holiness? Because if we cannot trust the One who is in ultimate control to be absolutely holy, so as to never sin against us or do anything but what is good, then we will tremble at every adversity. And why emphasize that He is true? Because we do not know the WHOLE truth until we understand His role in the world around us. Why emphasize the key of David on His shoulder? That we might know He is the ultimate authority – and no one nor anything else is. And why emphasize He has put an open door before us that no one can shut? That we might place our trust where it belongs – in the grace and power of the God who gave His Son to die on our behalf – that we might be reconciled to the Father by His blood, and look to Him in every circumstance of life – as our true security, safety and reward. Psalm 33:1–22 Shout for joy in the LORD, O you righteous! Praise befits the upright. 2 Give thanks to the LORD with the lyre; make melody to him with the harp of ten strings! 3 Sing to him a new song; play skillfully on the strings, with loud shouts. 4 For the word of the LORD is upright, and all his work is done in faithfulness. 5 He loves righteousness and justice; the earth is full of the steadfast love of the LORD. 6 By the word of the LORD the heavens were made, and by the breath of his mouth all their host. 7 He gathers the waters of the sea as a heap; he puts the deeps in storehouses. 8 Let all the earth fear the LORD; let all the inhabitants of the world stand in awe of him! 9 For he spoke, and it came to be; he commanded, and it stood firm. 10 The LORD brings the counsel of the nations to nothing; he frustrates the plans of the peoples. 11 The counsel of the LORD stands forever, the plans of his heart to all generations. 12 Blessed is the nation whose God is the LORD, the people whom he has chosen as his heritage! 13 The LORD looks down from heaven; he sees all the children of man; 14 from where he sits enthroned he looks out on all the inhabitants of the earth, 15 he who fashions the hearts of them all and observes all their deeds. 16 The king is not saved by his great army; a warrior is not delivered by his great strength. 17 The war horse is a false hope for salvation, and by its great might it cannot rescue. 18 Behold, the eye of the LORD is on those who fear him, on those who hope in his steadfast love, 19 that he may deliver their soul from death and keep them alive in famine. 20 Our soul waits for the LORD; he is our help and our shield. 21 For our heart is glad in him, because we trust in his holy name. 22 Let your steadfast love, O LORD, be upon us, even as we hope in you. So much wisdom in so few words.